Reasons Why IT May Be Crap! So far in my post series on use of Web 2.0 with students I have discussed our preconceived notions on our digital natives ability to use technology and why some students automatic response when you start using technology, for elearning, will always be THIS IS CRAP! Today I want to examine the reasons why the students saying THIS IS CRAP might be right! And for those waiting patiently for me to actually provide examples of how Web 2.0 is used with students I promise those posts start from tomorrow! The biggest mistake I am seeing with educators new to e-learning is they are so focused on working out how to use the tools that they are losing focus on the outcome they want to achieve with their students. Let me use the analogy of learning to drive a car. 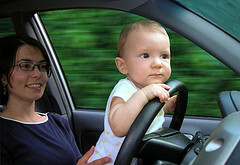 Reflect back to the first time you got behind the steering wheel of a car. Remember how stressed you felt? Now which pedal is the clutch again, where’s the brake gone? Oh no, I need to look in the rear mirror, the side mirror and indicate with the blinker? And if your parents were really lucky you managed, after lots of leap frogging down the road, to drive without crashing the car into anything major! We are so focused on everything we have to do to drive the car, because it is not second nature, that we find it hard to stay on the road. Well just as your parents didn’t want you to crash the car, and made you focus on the road, you need to maintain focus on what you are trying to achieve when you use Web 2.0 with students. And when you are learning these tools it is really easy to focus way too much on learning to use the tools and not enough on how you will use them with your students. Forget the tools, there just tools! Yes! I know it is easy for me to say! I’m experienced. But start by having a really good think about what you are trying to achieve? Write down all your thoughts. Then, and only then, think about how you are going to achieve the desired outcome and what tools are required! Feel free to comment on my blog about what you want to achieve as I am more than happy to provide possible solutions or point you in the right direction. Start using some of these tools for your personal learning. No time? Well you expect your students to learn in their own time, so shouldn’t you be making time? And these tools will end up saving you time. The more you use them in your life the better you will understand how you might use them with students. Don’t feel you need to know how to use them all straight away, start off slowly, one at a time. I’m Feeling Like Crap! Please Help Me Out!!! Right on the money Sue! Getting colleagues to accept the notion of digital technology creating exciting, valuable TOOLS for their work is the key to facilitating take up. That and getting them to ‘play in the sandbox’ (nice analogy used in some wikis for the importance of this playing and trying out of stuff). When I was a kid I would watch dad working round the place. He used to impress on me the importance of choosing the right tool for any job. He used his very well and always kept them well maintained. It’s a life lesson I’ve never forgotten. I am glad Laura you are enjoying this post series. I have really tried to tackle them differently from the way others are writing about Web 2.0. Kate actually it was your audio that convinced me that for some people you do really need to encourage them to play with the tools. I have always seen them as getting real work done. And definitely about sharping the tools and using them well.